Read about the AI Applications in the workplace: The good, the bad, and the ugly sides of AI and how to strike a balance. Amidst the entire rumpus about whether Artificial Intelligence (AI) is set to make or break the HR agenda, HR leaders are still figuring out ways to make AI work for them. According to a report by Bersin by Deloitte, 33% of employees expect their jobs will become augmented by AI in the near future. An IBM survey highlights that 46% of employees believed AI would transform their talent acquisition capability and 49% predicted that it would transform their payroll and benefits administration. 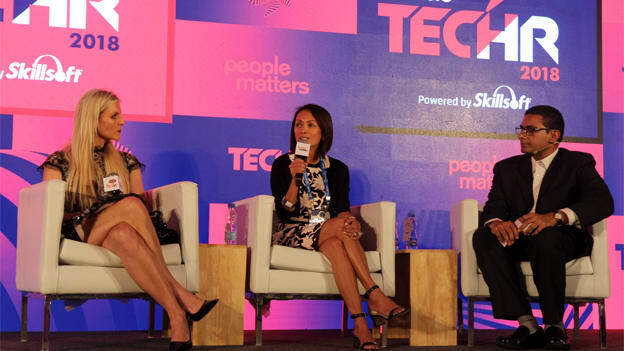 In the session, “99 shades of AI-The talent version” hosted by Grace Kerrison, Managing Director - Asia Pacific , Pymetrics, Joanna Riley, CEO & Co-Founder, Censia, and moderated by Kashyap Kompella, CEO, rpa2ai Research threw light upon the good, the bad, and the ugly sides of AI and how to strike a balance. AI is a great tool to collect and compile data quickly without the risk of human error. This help in reducing time spent on data handling and focusing on more value-adding tasks. It is also trained to identify patterns, and it can identify and learn any human bias that is present in your workplace. AI can identify potential bias in job descriptions and HR communication which can help in eliminating the bias at work. Additionally, AI succeeds in bridging the skill gaps and right job to the right person. A good match between the task and performer lead to enhanced productivity and profitability and saves both time and cost of the organization. Algorithms that are fed into machines are developed by the human mind which suggests algorithms can instruct AI to become biased. The essence of an ideal AI tool lies in the way it learns and trains itself. While a properly trained AI machine could help eliminate biases, an incorrect one might just become the most biased one out there. The panels were of the view that A.I. creates a sense of partnership between humans and intelligent machines. It isn’t a force to be feared in the workplace but embraced. They said that AI will not replace humans but only empower them to enhance their performance and productivity. The AI-enabled HR Technology system not only saves the money and time of the organizations but also leverages them to select people that best suit the demand of current businesses. Using AI tools, organizations can ensure diversity and eliminates biased-free environment.